While in Ann Arbor for the Everything is Terrible show last Saturday, my husband and I visited the terrific Dawn Treader Book Shop. I love Dawn Treader–I tried to work there once. An old man encouraged me to apply; then I went to turn in my resume and a different old man told me to forget it. I have a spotty track record with old men. Anyway, here are some books we found at Dawn Treader. 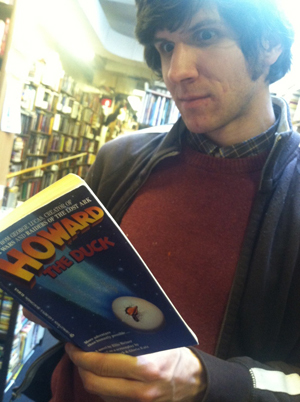 The first was the novelization of the George Lucas film, Howard the Duck. If you’ve never seen the movie, it’s about a duck named Howard who spends two hours trying to nail Marty McFly’s mom and then fights the principal from Ferris Bueller’s Day Off by driving a golf cart into him. It’s dire–and that’s coming from someone who’s seen Manos: Hands of Fate at least ten times. Someone sure did make a book out of it, though! I don’t know whether Chanur is a satyr or an Arabian prince with strange taste in head wear. What I do know is that this book somehow threatens our planet. Maybe it’s actually a cleverly-masked hydrogen bomb that detonates if you say “Chanur” three times while looking in a mirror. Spider Robinson is almost perfect, Ben Bova informs us, and I’m inclined to agree. This book could be 500 pages of nothing but the word “moist,” and Spider Robinson would still come out smelling like a daisy, because his name is Spider Robinson, for God’s sake. What is going on in this cover picture? The nicely-dressed woman in the foreground seems curiously unmoved by the ill-proportioned Second Life avatar raising Hell behind her. Why is he pitching forward and screaming? Why are there bullet holes in the garage door? Is it exploding? 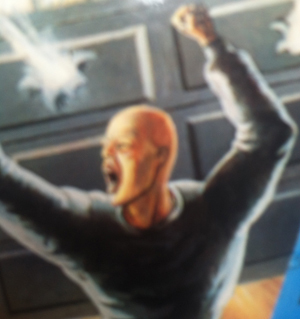 Or is the man yelling because some neighborhood kids punctured it with lawn jarts? 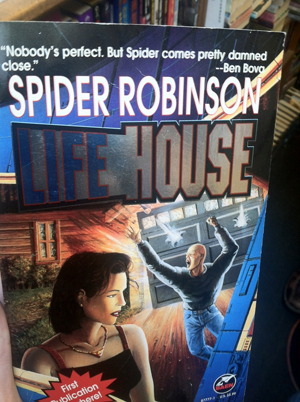 Only Spider Robinson knows the answers to these questions. This entry was posted in Weird Books and tagged books, bookstore, paperback, pulp covers, used books on May 21, 2014 by joannalesher.